The extended Walking Dead family recently shed tears again for Glenn again, but this time, they were tears of joy. 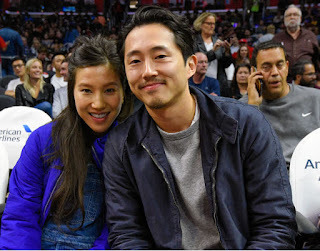 Steven Yeun, who played the fan-favorite character on the AMC zombie series since its debut, married his longtime girlfriend Joana Pak in Los Angeles Saturday. The two exchanged vows in front of family and friends, including several past and present Walking Dead stars, at the Paramour Estate in the trendy Silver Lake area of Los Angeles. The bride wore a strapless wedding ball gown and carried a bouquet of pink, purple and white flowers, as seen in an Instagram photo posted by Joana's sister Kayce Pak. According to multiple posts on social media, guests included Norman Reedus (Daryl), Andrew Lincoln (Rick), Melissa McBride (Carol), Chandler Riggs (Carl), Alanna Masterson (Tara) and former Walking Dead stars Emma Bell (Amy) and Sarah Wayne Callies, who played Rick's deceased wife and Carl's mom Lori. She posted a photo of herself at the wedding with Lincoln's real wife, Gael Anderson. Yeun also received much love and congrats from friends and fans online.